Vitamin B6 not only keeps you in a good mood, but also ensures a good energy metabolism and a strong immune system. 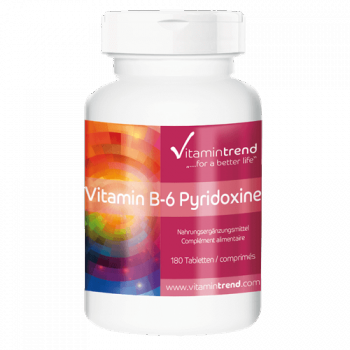 Vitamin B6 (pyridoxine) is processed in the intestines and liver and from there it is released into the body. A large part is contained in the muscles and blood plasma, and it is also found in the brain, kidneys and spleen. 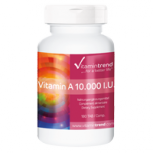 The total amount of vitamin B6 in the human body is about 100 grams, of which only about 10 percent is available. 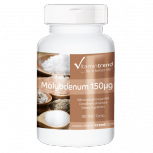 Vitamin B6 is involved in immune functions and influences, among other things, the biosynthesis of red blood cells. 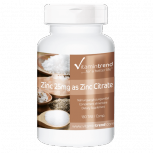 Derivatives of vitamin B6 are involved in about 100 enzymatic reactions in the body and are therefore important for protein metabolism. 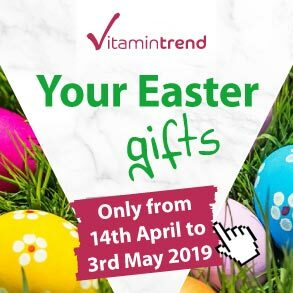 Pregnant women and persons taking oral contraceptives (birth control pills) or antibiotics may have an increased need for vitamin B6. Strength athletes and people who have a high protein intake also need more vitamin B6. 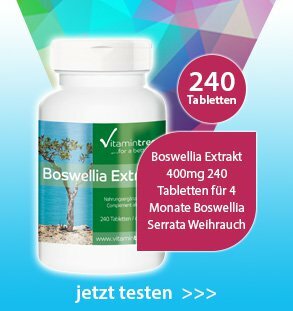 Recommended intake: Adults 1 tablet daily with a meal and plenty of water. 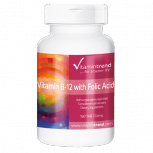 This product by Vitamintrend combines vitamin B12 with folic acid because both vitamins work hand in hand.